The difference between farce and comedy is generally accepted to be that farce achieves its effects through actions (called 'business' in the theatre) and comedy achieves its effects through language. That is only as true as any generalisation can be – farces have many very funny lines and in The School for Scandal, for instance, one of the great high comedies, the scene in which Lady Teazle hides behind Joseph's screen to avoid her husband, Sir Peter, and the screen gets over-turned to reveal her is a moment of pure farce. Farce has been around for quite a while. It's first heard of in the fourth century BC, coming from the city of Atella in Sicily, whence it had arrived from Greece. These early farces had stock characters (The Old Fool, The Glutton, Fat Cheeks) like, some two thousand years later, the commedia dell'arte (The Braggart, The Miser, The Buffoon). We don't know who the authors of these early Sicilian farces were but by the time we get to the farces of ancient Rome we know the best is Plautus, whose plays turned the norms of Roman life upside down, as did the much later Lord of Misrule when a person of the lowest status was King for a day. 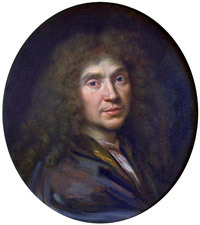 Molière was one of the few writers (along with Shakespeare) who could write scenes which were farce, high comedy, drama and revelation of character simultaneously, like the scene in Tartuffe in which Orgon, the husband, agrees to hide beneath a table to hear the holy man, Tartuffe, attempting to seduce his wife and then refuses to believe what he hears. He learned a lot from the commedia dell'arte in his early touring days and in 1658 shared a theatre in Paris with a company of Italian comedians. In the eighteenth and early nineteenth centuries, farce rather languished - though popular, it was used essentially as a short piece following the evening's main attraction. Then came a big revival with British authors such as Arthur Wing Pinero, W.S. 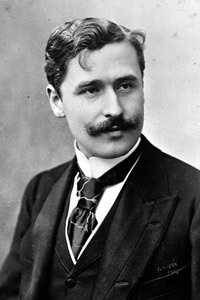 Gilbert and Brandon (Charley's Aunt) Thomas and, from France, Eugène Labiche, Eugène Scribe and the greatest farce writer of them all, Georges Feydeau. Feydeau is regularly revived in France and Britain though sadly the large casts he normally demands means he is becoming something of a rarity. Thomas Hobbes, the seventeenth-century philosopher, wrote in his seminal work, The Leviathan, "Sudden glory is the passion which maketh those Grimaces called Laughter; and is caused either by some sudden act of their own that pleaseth them; or by the apprehension of some deformed thing in another, by comparison whereof they suddenly applaud themselves." So the reason why we laugh at a man slipping on a banana skin (think Charlie Chaplin, Buster Keaton, Laurel and Hardy) is because we know that slipping on a banana skin can be a painful experience and we're glad it's not happening to us. And of course the more confident the person is, the more aware of his own dignity, the more delighted we are when he comes a cropper. So for a farce to work, it's necessary for the audience to relate to the characters' predicaments. With Feydeau, Ben Travers, right through to Michael Frayn and Noises Off this relates to middle-class morality. Which is not a criticism, just a statement of fact. All Feydeau's major plays hinge on marital infidelity. The wife resists the importunities of an espérant lover – normally a friend of the family – vowing to be true to her husband with the caveat that should she ever discover that her husband is being unfaithful to her, she will immediately seek revenge. Such a discovery naturally occurs very shortly and husband and wife are fated to meet in the second act, often set in a seedy hotel in a room which has been double-booked or in which one of the walls revolves at the touch of a button to reveal the bed from an adjacent room. Feydeau, whose plays are put together like an intricate piece of clockwork, was a great user of these modern devices – the electric chair which produces instant anaesthesia, the electric bells which are placed under the mattress to trap the guilty pair and catch them 'in flagrante delicto'. This occurs in Le Dindon, which I translated and directed for the Actors' Company with a cast that included Ian McKellen as a pageboy 'suffering from puberty'. The first time we rehearsed with the real electric bells (the hotel room had, of course, been double-booked and one of the innocent parties was deaf) we all laughed so much that rehearsal came to a complete stop. Feydeau makes much fun of people with impairments – the deaf woman, the man with a cleft palate, the man who stammers (though only when it rains), the man with bad breath. Although some people might declare this to be politically incorrect in these more sensitive times, that does not stop us laughing. The Hobbesian principle again: we're glad it isn't us. This is a short extract from a longer essay that will be published in the program for A Flea in Her Ear, which will be available at Box Office and The Bar for $10.